A soft and gentle boar bristle brush for children aged 3 to 6 years. It's ideal for a child's sensitive scalp, with one length of bristle only. With 5 rings of pure bristle tufts to stimulate blood flow to the hair roots, the density of the bristles allow conditioning sebum to be more evenly distributed from the roots to the ends of the hair. Mason Pearson Brushes Pure Bristle Child's is rated 5.0 out of 5 by 6. Rated 5 out of 5 by iBeheld from Best Brush for Fine Hair I have very, very fine hair, prone to breakage and now thinning slightly. I'd had to resort smoothing with dense baby brushes as anything with stronger bristles pulled too many strands out. 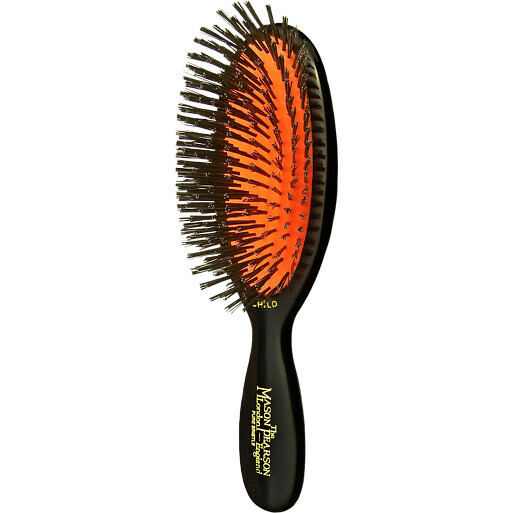 This brush, however, is perfect - it moves through the hair easily, and has a lovely 'bouncy' feel as it does so. It doesn't pull or strain my hair, but leaves it smooth and the scalp properly stimulated. I wish I'd invested in one years ago. I think the gentle stimulation on the scalp might help with the thinning - I'm hoping so anyway. The child-sized handle takes a little getting used to, but is no more difficult to use than a handbag brush. I highly recommend this to anyone with fine, delicate hair. Rated 5 out of 5 by Luzybel from Hairbrush Lovely birthday present for my 3 year old daughter. I had one when I was a child and still use Mason Pearson brush now... so hoping this present will be used for many years to come. Rated 5 out of 5 by Grandad from RIte de passage Every girl should start young with that lifelong classic essential, the Mason Pearson hairbrush. That's why little ones are available! And my grand-daughter Felicity will be getting hers (pink) -- and a lot of 'hair things' to go with it -- on her 3rd birthday, next week.